Summer has officially arrived in the northern hemisphere, and when those elusive hot days grace us, a lot of us spend a lot more time in the Sun. Protecting ourselves from the Sun’s harmful UV-rays is something that is diligently advised because of the carcinogenic nature of the damage caused in sunburn. Melanoma is one of the deadliest skin cancers, and sun damage is its major cause. To find out more about this type of skin cancer, we’ve been given the opportunity to ask an expert from the field of dermatopathology. Today’s expert is Dr James Carton. Dr Carton is a consultant histopathologist at Imperial College. He has been a specialist dermatopathologist since qualifying, and reports the full range of inflammatory and neoplastic dermatopathology, including alopecia cases. He is also the author of the Oxford Handbook of Clinical Pathology, part of the world renowned Oxford Medical Handbook series. What are the incidences of melanoma based on race/skin type? Have we seen increases in incidence of melanomas relating to the depletion of the ozone? What is a Dermascope? Is one used in diagnosing melanomas? Are there different types of melanomas? What, if anything, determines the prognosis of a melanoma? 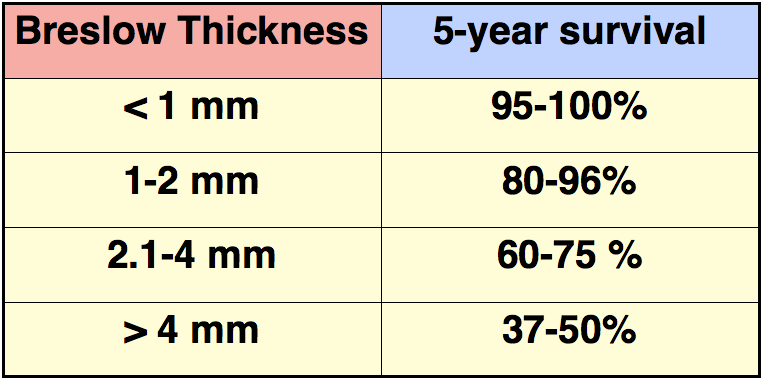 A table showing the Breslow thickness classification and its relationship with approximate 5-year survival. Can you get a melanoma on parts of the skin that are not exposed to the Sun? I’ve read that some melanomas are a result of a mutation in the BRAF gene. Is it the Sun that causes this mutation, or is it just a faulty gene the person is born with? Do immunohistochemical tests help confirm a diagnosis of melanoma? Do melanomas have a tendency to spread to other sites of the body? 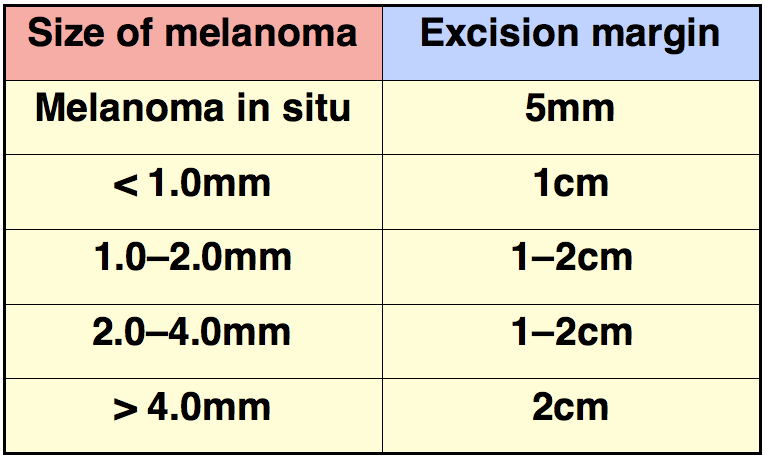 A table showing the guidance for clear (tumour-free) margin excision according to the size of the malignant melanoma lesion. We hear all the time about using creams to protect us from Sun damage, but is there anything else we can do to protect us? Is there anything about our diet that can help? A huge thank you to Dr Carton for his time participating in this month’s Ask The Expert. 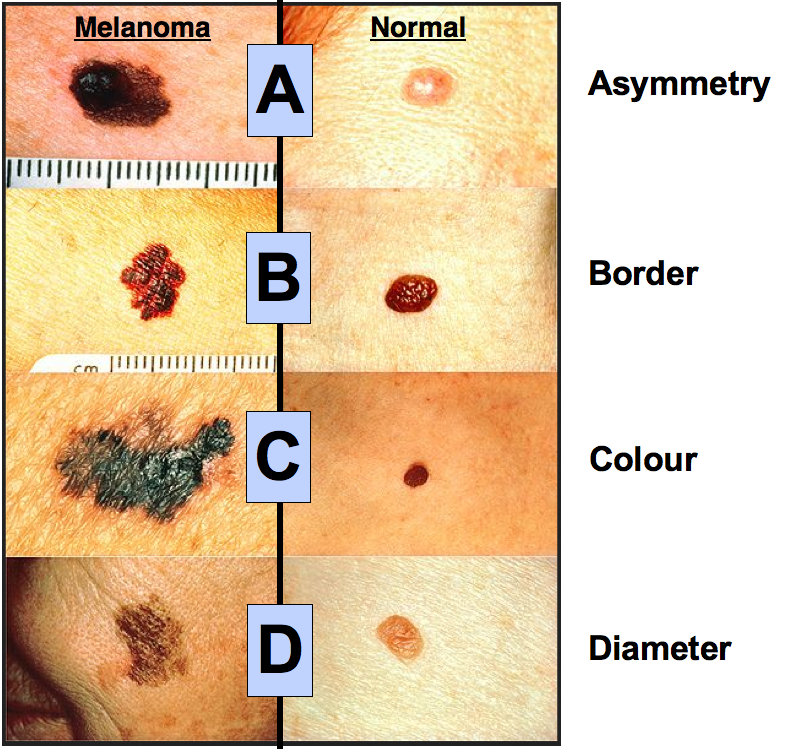 Use the ABCD rule for detecting a melanoma yourself. A type of melanoma was featured in a previous HistoQuarterly. See here for a detailed histological description of the Superficial Spreading Malignant Melanoma. Thanks for helping me learn more about melanoma. I didn’t know that there were different subtypes of this, like nodular melanoma or acral lentiginous melanoma. I’m interested to learn more about the differences between these subtypes and how they are determined.